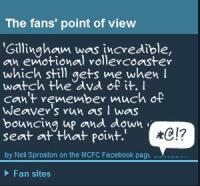 Are You Interested in the Fans' Point of View? Are you looking for ways to make your team website more fan-centric? Are you looking for new ways to incorporate the voice of the fan in your team offerings? Manchester City FC of the English Premier League have done a tremendous job creating an outlet for fans to have a voice on their club's official website. The team created a designated section called "The fan's point of view" that provides a list of team-related sites created by Manchester City fans for fans. 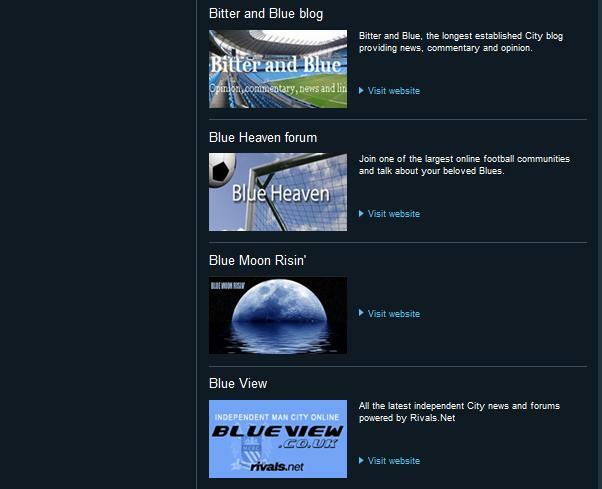 The designated fan site page enables the club's supporters the opportunity to submit details and a jpeg of their site for the chance to have it featured on the official Manchester City team homepage. The team includes everything from official sites to blogs to individual forums. Manchester City's claim is "if it's Blue, and it's online, chances are we've found it". The team also features an interesting "My First City Game" segment on its team website where fans can add a short synopsis of their first experience attending a Manchester City Game.